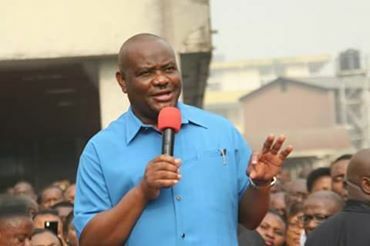 On Tuesday, Rivers State Governor, Nyesom Ezenwo Wike reiterated his warning to those planning to rig the rerun elections in Rivers state, noting that they will be treated as armed robbers by the people. Addressing thousands of civil servants at the State Civil Service Secretariat in Port Harcourt , Governor Wike said that the public holiday signifies God’s intervention in the affairs of Rivers State. He said: “Every January 27 will be observed as a public holiday in this state because that is the day God came down to save Rivers State. What people must understand is that power comes from God. We know God speaks last and he has spoken”. The governor also announced that Friday February 5, will be observed as a public holiday to enable all Rivers people prepare for the rerun elections. Governor Wike urged the civil servants and other Rivers people to ensure they vote for PDP candidates in the re-run elections to promote harmony in governance and sustain the development agenda of the state government. The governor assured civil servants and pensioners that his administration will continue to pay their salaries and pensions. He said all welfare issues will be given top priority. He, however, stated that steps will be taken by the administration to verify the actual number of civil servants and pensioners to stop payment to non-existent beneficiaries. The governor added that the administration will work out modalities to improve the state’s internally generated revenue. Earlier, Head of the State Civil Service, Barrister Rufus Godwins commended the governor for being up to date in the payment of salaries and pensions. He assured the governor of the loyalty of the workers.